FEYRUHN is in need of a home. detailed Spawn cities for your server? Feyruhn is my personal piece of paradise. I was never able to find an RPG city in all the games I've played that shared my vision. Sooooo.... I am creating it! 5 years in the making (so far), Feyruhn is one of the Largest cities you will come across in a non-creative environment with each block placed including landscaping to achieve a maximum aesthetic value, and after a multitude of arm twisting from the players on my server I am creating this thread dedicated to it's Fruition. Feyruhn is made up of 8 Districts, The City District, The Frontier District, The Market District, The Moors District, The Temple District, The Northern Frontier District,The Castle District and The Harbour District. This area Contains the seaside Medieval village of Fort Feyruhn and is unique in that it's design was incorporated into the natural terrain surrounding it, Massive hills and scenic trails cover it's vast treescapes. Fort Feyruhn was the 1st district created that had it's beginnings on a 1.4 beta world back when large mountains were generated with multitudes of trees naturally. This area also contains Rails for local transportation and all of the world portals as well as multiverse portals. The Frontier district also contains the Skyway Hub that house's rail transportation out to the vast world of Elysium. Vast Cliffside dwellings and an underground Mining colony can also be found in this district as well as treehouse dwellings. (Status: Incomplete) A massive Port will be added in the future. In the heart of Feyruhn, this district contains all the largest place of commerce in all of Elysium. The Market area surrounds a Massive Mob arena known as "The Pitt of Souls" That is a sight to behold. In the center of dank dark corridors is the player area its self. This Arena is an adventure on it's own and was created by Sin90 an incredible designer in Elysium. 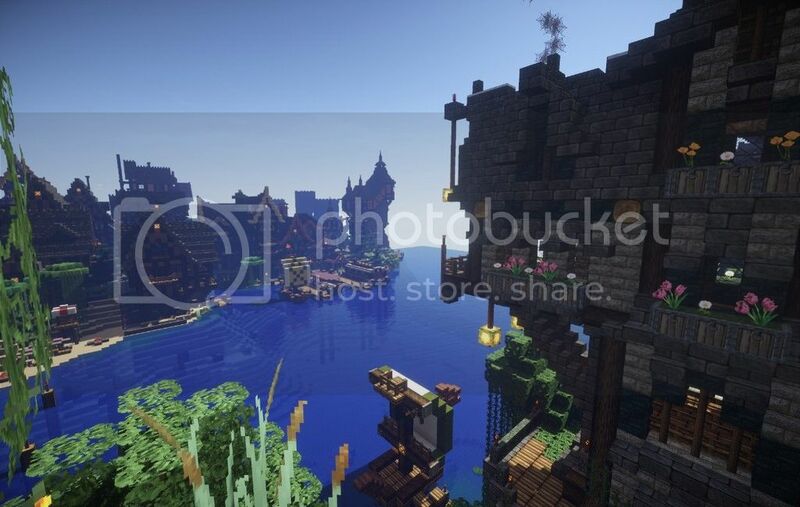 The Market district also contains other activities such as The Spleef Arena, and the Tedious Silverfish challenge known as "The Sanctum". 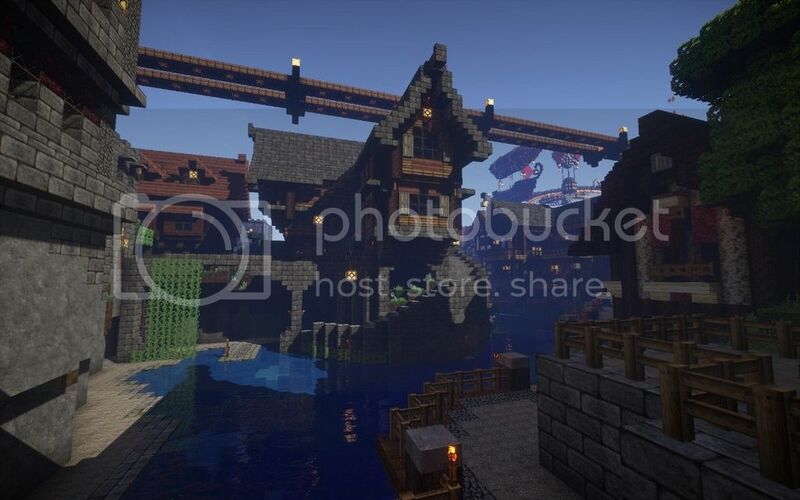 Many Factories surround the Market place appealing to it's economic theme. (Status: Incomplete) More Factories and Activity builds planned for this District. Also known as the Stillwater Moors is considered the Poor to middle class District in Feyruhn, The Moors contain multitudes of swamp lakes surrounded by a medieval farming community in many areas. Row houses and ghetto's can also be found amongst the Moors. Vegetation is thick in this District and Vines grow from just about every crevice. Downtown Stillwater is in the Heart of the Moors and has a bit of a western feel due to its vast connecting and numerous Balconies overlooking the streets below. Aged architecture is in abundance and sets the tone for it's economic standing. (Status: Incomplete) Many more houses, Universities, Agricultural developments and the PVP Arena will be added to this District. This District was Strictly built by Sin90, Who also Designed and Built our fabulous Mob Arena. The Temple District includes Sins Massive Castle and a Full scale rendition of the Cathedral from Oblivion. One walk through this district and you'll understand why we named it the Temple District. Very symmetric and detailed designs give you a very culturistic impression. We're talking high society worship!! Have a Tour and be sure to Give Sin90 a Holler for his Fantastic work!! Carved into the rock faces below almost with an Incan influence. A massive Lake resides under the Castle with a glass bottom seperates the Upper Burrows from the Lower Burrows with Viewing tunnels strategically placed for viewing from above, or viewed first hand by taking 1 of many elevators to take you to the Lower Burrows to see it from the Bottom up. (Status: Incomplete) This District only has a few details to be done to be complete. Dense Forage laces this district in it's lower area's until you ascend up the Mountains to the Snow covered upper village called Nordmar (After my love for Gothic). This is a Vast District including an area of Steampunk Delight down "Steampunk Lane". 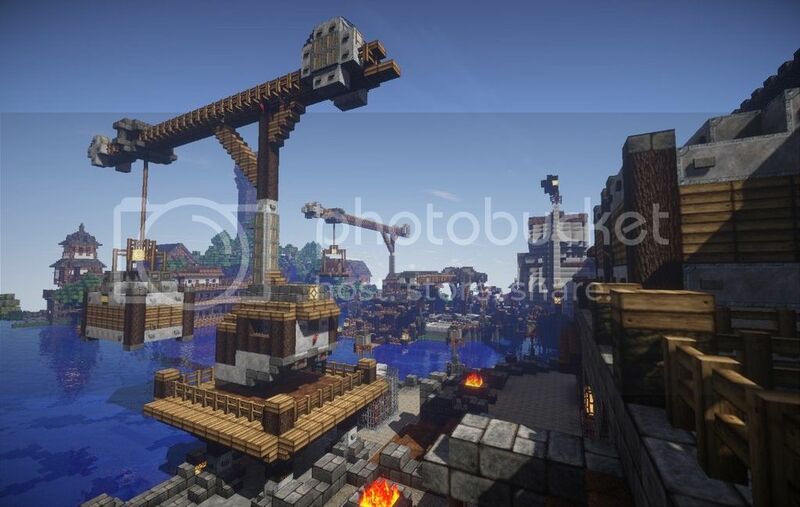 Take the Minecart tour that provides some great vistas in this highly diverse area. Adventure Awaits!! This Area is the Newest District in Feyruhn and my personal Favorite. Bayshore Housing Galore!! This is the Harbor town you've all dreamed of vacationing at and the city horizon with it's depth and Rooftop peaks make this area a Delight to explore. A very diverse design, with Towers, Watermills and Houses straight out of your Fantasy imagination. There are so many Large and Fantastic Builds out there and I plan on contributing in this fashion in the Future, But my goal with Feyruhn is a bit different. Instead of making one epic and amazing build I set out to create a city made up of thousands of Components all being part of a greater whole, a Single entity in it's entirety Known as Feyruhn. I will be posting Screenshots on this thread regularly of what is done and what is planned. Feyruhn can be visited by anyone anytime as our server is Greylist, meaning you dont have to be a member to explore. You can find Feyruhn and many other incredible player builds at Crafters Guild. I'm always open to new ideas and welcome any suggestions and additions. Is in need of a home. 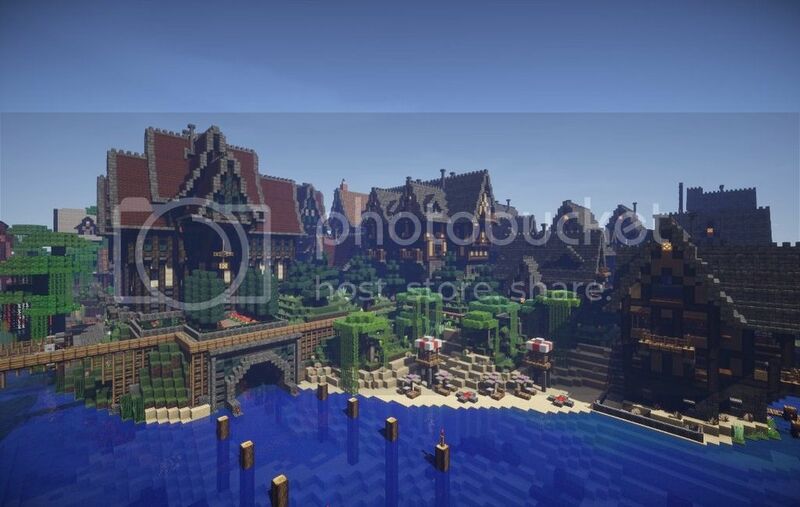 PM me if you are interested in hosting this great spawn city. Detailed, green, rambling, freestyle- exactly my type of city! And you say this was done in survival too? So much work... but the end result is absolutely stunning! I might hop on your sever some time so I can explore the city in person. Something tells me that there's much more to see besides the tantalizing glimpses the screenshots offer. 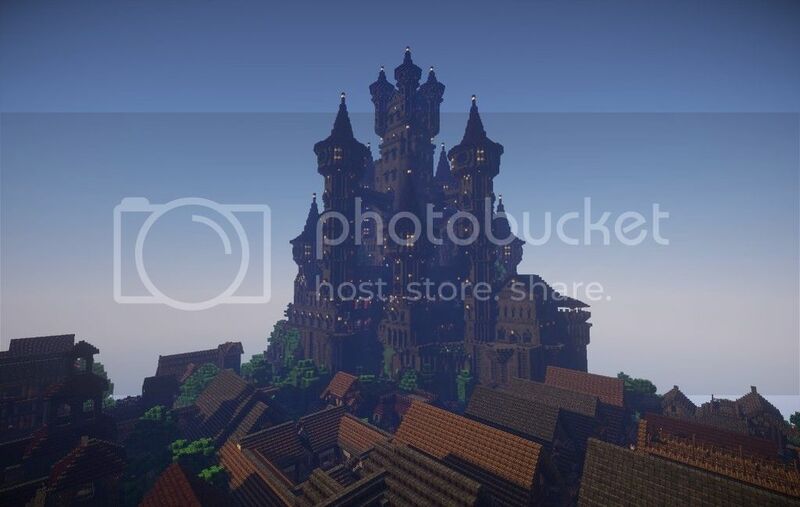 Wolf-themed castle, treetop village, pirate cove, and a sprawling medieval town- click below to check out our fantasy world! The Texture Pack is a combination of Misa's and some changes I've put in personally. Approximately 25 % of the Textures are custom. Anyone is Welcome to give it a whirl. Here is the Link to The Pack. Again Much Credit To Misa, she has an incredible ability with color spectrum correspondence. I've always wished for the kind of vision it takes to create something awesome like this... I've experimented a lot, and just fail horribly. I'm perfectly willing to put in the time, I just don't have the gift. 5 stars man. Do you usually build freestyle, or plan structures external to minecraft? I'm similar in the regard that I want to build big in survival mode, creative is good for proof of concept, but largely feels "cheaty" to me. I get the same problem too man, I make a world, start on it and eventually forget about it because I'm not happy with my creation. I intend to fix that though. Do you usually build freestyle, or plan structures external to minecraft? To answer your question i would say yes and no, I don't plan ahead per say, rather the surroundings themselves inspire the next design. The Terrain generally tells me what to do next as far as placement and proximity. The House design's again are influenced by the surrounding buildings and terrain and are planned in my head but they don't always translate that way, in that case i merely try various trimming methods until i find a good flow. Complexity is chaos without the proper flow or Feng shui. Wow, quite impressive! I could never in my wildest dreams pull off something like this. I enjoyed the detailed text narrative too. It probably doesn't help that I feel the need to build everything either super tall, or under water in my worlds. Obviously the RPG theme here doesn't require the height, but are the buildings/rooms actually serving an intended purpose, or are we not at that stage yet? It'd be awesome to see players and/or NPCs everywhere. 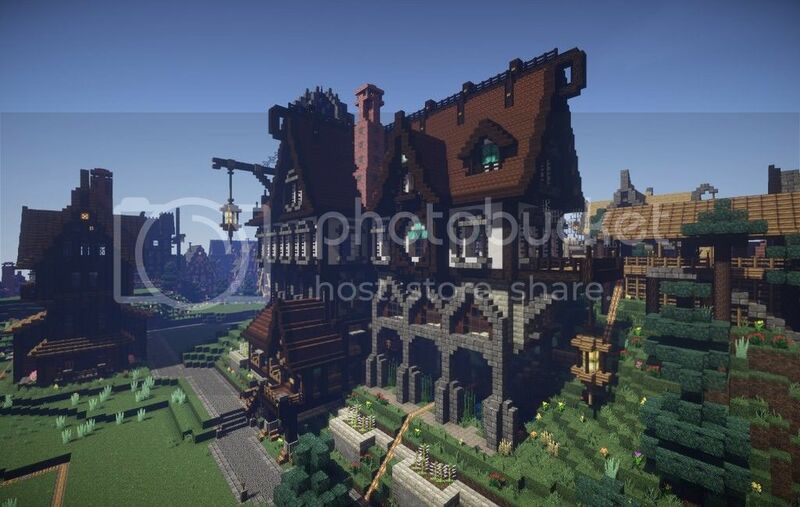 I'm currently using buildcraft and industrialcraft because I want my big houses and skyscrapers to function AND look pretty. The mods have so much stuff in them, you can create purpose-built rooms for any structure. When I build big, I usually also try to plan things out ahead of time. I'll have to work on that "build-as-you-go" method. Can we have an aerial screenshot? There are a few Villagers here and about But the region currently contains over 300 structures. Some do have a function but the majority are aesthetic. Redstone is not my forte but we are currently working to incorporate quests on the server that may provide more functionality within the region and it's structures. The Market place contains the most functionality and the Frontier District has a bit as well. All ships either contain portals to other towns or will in the future. The Moors District is the area i am currently developing. I mentioned in a previous post about depth loss from an Aerial perspective and wanted to provide an example of what I meant by that with the 2nd screen in this post. In my opinion Surrounding terrain and Vegetation is every bit if not more important then the build its self, these details are a huge factor to the flow of the build, Tree placement, Terrain Height/diversity, forage etc, are positioned to enhance the visual aspect. looks pretty fricking awesome if i do say so myself. great work. i absolutely <3 the house in the first pic. great detail. I...I... I want this. Congrats on an awesome build. Wish I could do this!